“If the God of my father, the God of Abraham and the Fear of Isaac, had not been on my side, surely now you would have sent me away empty-handed. God saw my affliction and the labor of my hands and rebuked you last night” (Gen. 31:42). As today’s passage begins, Laban is standing before Jacob and his family with egg on his face. His search for his false gods has proved fruitless (Gen. 31:33–35), and he is shown to be a fool in assuming his son-in-law left with his idols. True, the statues were in Rachel’s possession, but her husband is ignorant of this fact, and thus Jacob’s innocence vindicates him. Jacob now lays into his father-in-law and proves his righteousness. It is altogether remarkable how Isaac’s son has grown spiritually since we first met him. For example, Jacob has not only been relying less and less on deceit, he has become scrupulously honest with Laban, the one who relished taking advantage of him. Ancient Near Eastern custom did not obligate shepherds to cover losses their master incurred when wild animals destroyed parts of his flock (see Ex. 22:10–13). But Jacob willingly paid the cost and gave his own animals to replace Laban’s livestock (Gen. 31:39). Standing before Laban is a true believer in Yahweh, one who has gone the extra mile even for his enemy (Matt. 5:41). Verse 42 of today’s passage is the clearest evidence of Jacob’s radical turn from devious selfishness to faithful service. No longer is he inclined to trust only on his own wits for survival and blessing. Instead, he acknowledges God’s hand in his life. Though it took twenty years of backbreaking labor to teach him (vv. 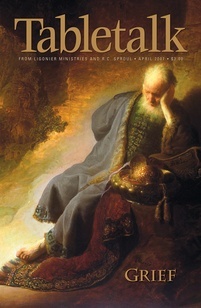 40–41), Jacob is finally learning that he can do nothing without the Lord’s grace. God later promises Moses that the Israelites will not leave Egypt empty-handed (Ex. 3:21–22), and today’s passage reassured the people that the Lord keeps His Word. If God’s presence made sure their father Jacob was not sent away in poverty, then His presence among them would also ensure they would not leave slavery destitute. Moreover, as God’s people, chosen to bear witness to His holiness, the Israelites were to imitate divine generosity and provide for their slaves when they set them free (Deut. 15:12–14). And even though we do not have slaves today, generous giving is still part of what it means to be the Lord’s chosen people (2 Cor. 8:1–15). One of the ways we can “measure” our spiritual growth is to take a look at how we have grown in our generosity. The longer we serve the Lord, the more conscious we should be of His free gifts. Not only has He granted us our undeserved salvation, He has gone far beyond this in granting us all with various gifts. If He has been willing to do this for us, we can do naught but imitate Him. Are you becoming more generous every day?